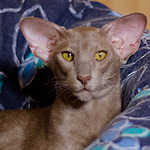 Thank you, Kseniya, for this sweetest boy ever! Walle came to us from cattery "Jubatus". He is grandson from our Akela. I was dreaming to take Akela's grandson in our breeding again, so that dream came true.